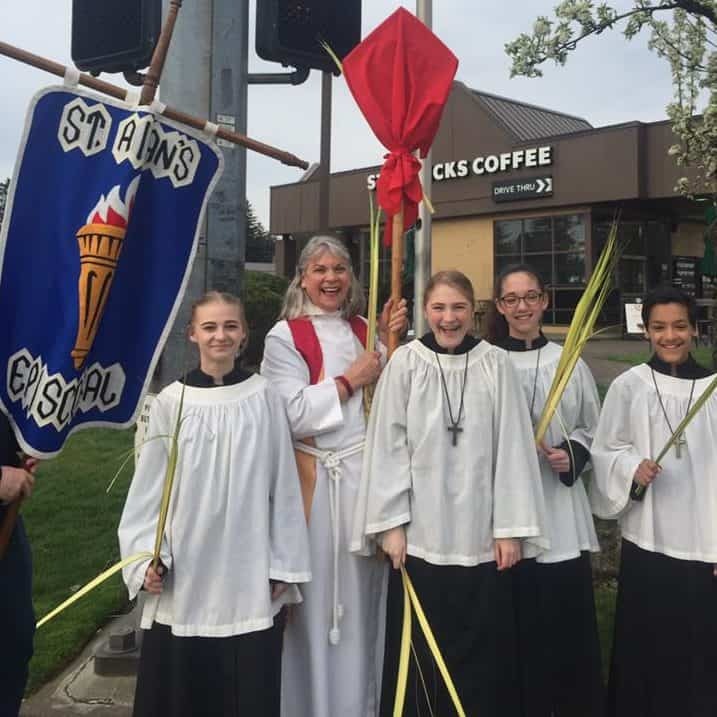 Mother Esme and acolytes processed around the neighborhood on Palm Sunday 2018. St. Aidan’s, Portland, announces with great joy and thanksgiving, the elevation of the Rev. Esme Jo Culver’s position to Rector, thus confirming her assignment to our parish. We are grateful for Bishop Hanley’s confidence in Mother Esme’s+ leadership and direction as she continues to inspire the vestry and congregation to move in a new direction of radical hospitality. Three years ago the Rev. Esme Jo Culver arrived at St. Aidan’s as priest-in-charge. The search committee sensed that her experience, vision and energy would be a great fit for the congregation. Fast forward three years, and it appears that we have chosen well. St. Aidan’s, Portland, is a growing congregation with such programs as The Great Thou Art Camp, the Celtic Festival, and St. Aidan’s Basket which supports our direction to “Feed My Sheep.” These programs, together with an array of opportunities for Christian Education and Formation, such as the Cuthbert Community of Benedictine Study, men’s and women’s retreat, the Catechumenate, and other ministries, identify St. Aidan’s as a welcoming community of Faith. There is new camaraderie and a sense of service with the Prayer Shawl Ministry, the newly formed Animal Ministry, and Anam Cara (meaning soul friend), a name being used to embrace opportunities for intergenerational activities and events. That’s church, wherever, however, and whenever we find it.